Not even two months ago, I was eating a chimmichurri rib eye sandwich and bemoaning the lack of chimmichurri options in the world at large. Last Saturday, I walked into Wally’s cheese shop and caught sight of the special. 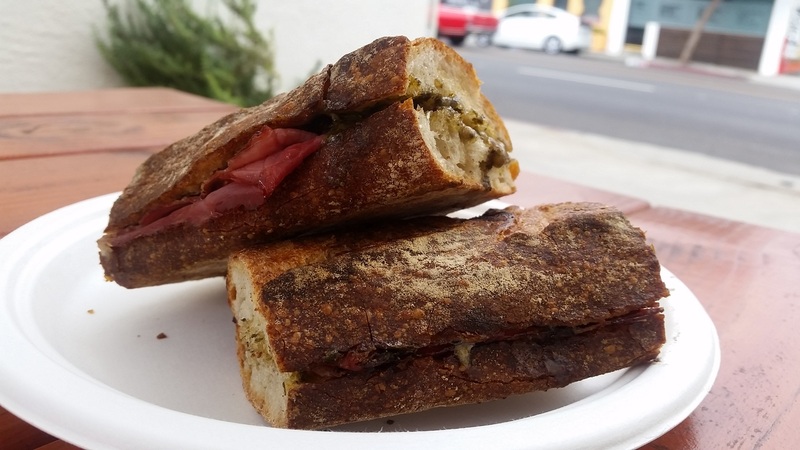 Wally’s specializes in grilled cheese sandwiches, but this was something a bit different: pastrami, chimmichurri and aged Gruyère. Now, despite my having featured Wally’s before I imagine this was just a coincidence, but what a delightful coincidence it was! The rich, herbal chimmichurri was well paired with the smoky pastrami, and the nuttiness of the aged Gruyère rounded things out in a way that was hardly expected but really quite successful. This is not a sandwich without risk, the flavors involved could easily have clashed. But this is exactly the sandwich I was talking about when I wished chimmichurri was used more widely, and I salute Wally’s for accepting the risk and coming out with something delicious. This entry was posted in Sandwich Reviews and tagged Cheese, Los Angeles, Reviews by Pete, Sandwiches I Have Eaten, Westwood by Pete. Bookmark the permalink.